CopyFromRecordset of Excel VBA Range method can be used if you want to copy the data from a record set. When we deal with data bases using ADO or DAO, we often retrieve the data using select statement to a record set, and we process to an array or we paste into a range. 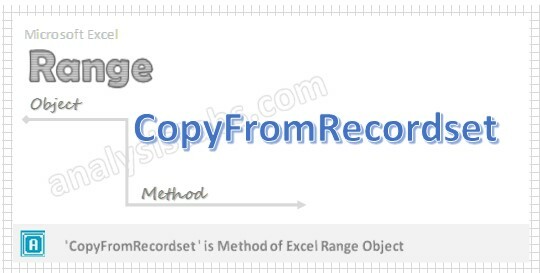 CopyFromRecordset method of Excel Range object will help to copy the data from record set to a specific range in the Excel using VBA. Here is the syntax of the CopyFromRecordset method of range object. MaxRows are the maximum records to be copied, by default all records will be copied. MaxColumns are the maximum fields to be copied, by default all fields will be copied. Here is the simple example to use VBA to Copy the record set into Excel Worksheet. sSQLSting = "SELECT * From [Sheet1$]"
CopyFromRecordset method will take some time to copy the data into worksheet. The last two example are generally used while testing a connection to a data base. So that we can save some time . How do I get the 2nd and the 5th field from the record set? I have the first I have field names already in the spreadsheet, and don’t want to include that and fields 3 and 4.
how do we get the data from ms access table and how we connect to it? i have used exactly same technique to connect to db(sql server) but the mentioned statement (Sheet2.Range(“A2”).CopyFromRecordset rs) is not copying any record to the sheet. it is not throwing any error as well. Please help.